Lhermitte-Duclos disease (LDD), also known as dysplastic cerebellar gangliocytoma, is a unique disorder of cerebellum with the features of malformation, hamartoma and benign neoplasm. Although it is categorized as a WHO grade I tumor, its histology is more likely a hamartoma with enlarged abnormally developed cerebellar folia containing dysplastic rather than neoplastic cells1,2. Combination of aberrant migration and hypertrophy of the granular cells have been shown to be responsible from its histogenesis2. Since the initial report by Lhermitte and Duclos in 1920, LDD was reported to occur at any age but most cases are identified in adults at 3rd or 4th decades2,3. Accumulating evidences indicate a strong association between LDD and Cowden disease (CD), which is a multiple hamartoma syndrome with an increased risk of benign and malignant tumors4,5. Germline mutations in the phosphatase and tensin homologue (PTEN) gene on chromosome 10 was found to be linked to both conditions and the loss of inhibitory influence of PTEN on the PI3K pathway and activation of the AKT/mTOR signaling was suggested to be the responsible pathogenetic mechanism5,6. Nevertheless, sporadic cases are also well known, particularly if the onset is in the childhood6,7. Presentation of the disease may be variable but most common symptoms are progressive mass effect in posterior fossa with cerebellar dysfunction and increased intracranial pressure. Magnetic resonance imaging (MRI) is certainly the imaging modality of choice and it usually displays a hyperintense lesion with a characteristic striated pattern of exaggerated folia in T2-weighted images8. In particular for pathologist, making a diagnosis of LDD can be extremely difficult in the absence of proper clinical information. However recognition of the disease carries critical importance not only for differentiating it from other cerebellar tumors, but also making a prompt clinical examination with respect to CD. Here we present four cases of LDD in a histopathologic perspective. Clinical and radiological background of each case was also provided. Informed consents were obtained for all the cases prior to this report. Case 1: A 42-year-old male presented with headache, blurry vision and seizure. His physical and systemic examinations were normal. Bilateral papilledema was observed in neurological examination. Cranial MRI revealed a well-defined lesion in the right cerebellar hemisphere, hypointense to brain parenchyma on T1-weighted images. The lesion was slightly hyperintense on T2 weighted images. The cerebellar folia were prominent with compression to 4th ventricle and causing hydrocephalus (Figure 1A-C). The patient underwent surgical removal with the suspicion of LDD. Pathological evaluation of the H&E stained slides revealed multiple fragments of cerebellar tissue without an apparent change. Close examination demonstrated some neuronal appearing cells forming two or three disorganized rows in one of the fragments. The cells had large vesicular nuclei and prominent nucleoli. The orientation was haphazard and there were some smaller ganglionic cells and a few Purkinje cells in between. Some nuclei were pleomorphic but mitosis was absent. A cystic degeneration was observed in the neighbouring molecular layer (Figure 2A,B). An immunohistochemistry panel composed of glial fibrillary acidic protein (GFAP), synaptophysin, chromogranin, neurofilament, Ki67 and PTEN was applied. GFAP positivity was observed only in the fibrillary background whereas synaptophysin, neurofilament and chromogranin positivity demonstrated the neuronal nature of these cells (Figure 3). PTEN expression was weak and variable. Ki67 labelling was observed in one or two isolated cells. The family history was negative for CD. No hamartomatous lesion was found in physical examination. The post-operative course was uneventful and patient is doing well at 10 years follow-up. Click Here to Zoom Figure 1: T2-weighted axial (A), coronal (B) and sagittal FLAIR (C) sections showing a well-defined and slightly hyperintense lesion in the right cerebellar hemisphere. 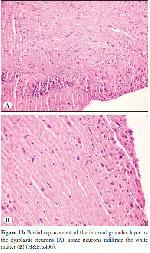 Click Here to Zoom Figure 2: Slightly enlarged internal granular layer (A) Dysplastic neuronal cells in the internal granular layer of cerebellum (B) (H&E; x200, H&E; x400). Click Here to Zoom Figure 3: Synaptophysin positivity in neuronal elements (Synaptophysin; x400). Case 2: A 26-year-old female complained of ataxic gate and dizziness. Her physical, systemic and neurological examinations were normal. Cranial MRI demonstrated a well-defined lesion in the left cerebellar hemisphere that was slightly hypointense on T1-weighted images and hyperintense on T2 sections. The patient underwent surgery and frozen section was performed with an initial diagnosis of low-grade glioma. The post-operative MRI revealed a residual mass lesion (Figure 4A-D). Re-evaluation of the frozen sections demonstrated a subtle irregularity in the internal granular layer. The usual fine fibrillarity was lost in the adjacent white matter, eosinophilia was increased and white matter somewhat appeared as an amorphous pink material requiring to be differentiated from the necrosis (Figure 5). However, the subsequent routine follow-up slides clarified that it was not the necrosis but the extensive vacuolation of the white matter underlying the pink amorphous appearance. In the squash preparations the background was fibrillar and in focal area there were a few cells corresponding to the dysplastic neurons (Figure 6). The post-operative course was uneventful. The H&E stained slides of operation material revealed cerebellar fragments with prominently enlarged and disorganised internal granular layer. The cells had large vesicular nuclei and demonstrated some degree of pleomorphism. Mitosis was not observed. Orientation was haphazard with some overlapping. Normal ganglionic cells were very few. Extensive vacuolation throughout the molecular layer and white matter was a striking finding (Figure 7). On immunohistochemical evaluation, GFAP positivity was observed only in the fibrillary background whereas synaptophysin, neurofilament and chromogranin positivity demonstrated the neuronal nature of these cells. PTEN expression was weak and variable (Figure 8). Ki67 labelling was observed in one or two isolated cells. The family history was negative for CD. No hamartomatous lesion was found in physical examination. The postoperative course was uneventful with exception of the residual mass appearance in MRI. The patient improved and was doing well at 6 mounts of follow-up. Click Here to Zoom Figure 4: Postoperative T1-weighted axial MRI (A), T2 weighted axial (B), coronal (C) and sagittal FLAIR (D) images showing a well-defined residual mass in the left cerebellar hemisphere, slightly hyperintense on the T2 sequence. Click Here to Zoom Figure 5: A subtle irregularity in the internal granular layer. Increased eosinophilia and loss of fibrillarity through the white matter in frozen section (H&E; x200). Click Here to Zoom Figure 6: Small ganglionic cells and a few dyplastic neuros in a fibrillary background of a cytologic preparation (H&E; x400). Click Here to Zoom Figure 7: Large vesicular nuclei and prominent nucleoli of the dyplastic neurons of the internal granular layer (H&E; x400). Click Here to Zoom Figure 8: GFAP expression is limited to the background (GFAP; x400). Case 3: A 77-year-old female was admitted with severe headache. Her physical, systemic and neurological examinations were normal. MRI demonstrated a right cerebellar lesion and a pontocerebellar arachnoid cyst with mass effect on T1 and T2-weighted sections (Figure 9A-F). Biopsies were taken due to the co-morbidity of the patient. The initial diagnosis was LDD. Pathological evaluation revealed fragments of distinctly vacuolated white matter. Among these, a small cerebellar fragment with haphazardly oriented and enlarged internal granular layer was observed. The cells of the internal granular layer had large, vesicular nuclei. Scattered cells with nuclear pleomorphism were detected. Mitosis was not present and a few ectatic vessels were observed in the lesion. Immunohistochemistry demonstrated immunoreactivity with synaptophysin, neurofilament and chromogranin (Figure 10A-C). The dysplastic cells were totally negative with GFAP and PTEN (Figure 11). No nuclear staining was detected with Ki67. The family history was negative for CD. No hamartomatous lesion was found in physical examination. The patient died in two mounts after biopsy. Click Here to Zoom Figure 9: T2-weighted axial (A), T1-weighted axial (B), DWI (C), T2-weighted axial FLAIR (D), T2-weighted coronal (E) and T2- weighted sagittal FLAIR (F) images showing right pontocerebellar arachnoid cyst and thickening of cerebellar folia with striations and abnormal signal. The lesion is bright on diffusion-weighted images as well as on the ADC map. Click Here to Zoom Figure 10: Extensive vacuolation and dilated vessels in the white matter (A) Nuclear pleomorphism in dysplastic neurons (B) Chromogranin positivity in the neurons infiltrating the white matter (C) (H&E; x400, H&E; x400, Chromogranin; x400). Click Here to Zoom Figure 11: Loss of PTEN expression in neuronal cells (PTEN; x400). Case 4: A 19-year-old female presented with headache and dizziness. Her complaints started three months ago. Her physical and systemic examinations and neurological examinations were normal. MRI demonstrated a right cerebellar hyperintense lesion compressing the fourth ventricle in T2 images. The lesion was slightly hypointense on T1 sequence. Surgical removal was performed with an initial diagnosis of low-grade glioma. The post-operative course was uneventful. Pathological evaluation revealed small fragments of cerebellar tissue without any apparent neoplastic infiltration. Cystic vacuolation was not so prominent. Careful examination demonstrated some large vesicular nuclei in the internal granular layer with a disordered arrangement. A slight pleomorphism was observed and some identical cells also appeared to infiltrate the white matter (Figure 12A,B). Immunohistochemistry demonstrated immunoreactivity with synaptophysin, neurofilament and chromogranin (Figure 13). The dysplastic cells were totally negative with GFAP. PTEN expression was weak and variable. No nuclear staining was detected with Ki67. The family history was negative for CD. No hamartomatous lesion was found in physical examination. The patient improved and was doing well at 2 years of follow-up. Click Here to Zoom Figure 12: Partial replacement of the internal granular layer by the dysplastic neurons (A), some neurons infiltrate the white matter (B) (H&E; x400). Click Here to Zoom Figure 13: Neurofilament positivity in neuronal cytoplasms (Neurofilament; x200). Lhermitte-Duclos disease (LDD) is a unique disorder of cerebellum and its pathologic bases have long been debated. It had been suggested to be a neurocytic blastoma, hamartoma or hyperplasia. Currently it is known to be associated with CD and both conditions are linked to germ line mutations on PTEN gene. There are also sporadic cases that lack a PTEN mutation and CD phenotype, especially if the onset is in the childhood5,6. Since it is a quite rare disorder with both neoplastic and hamartomatous features, the clinical and pathological diagnosis of LDD can sometimes be challenging. Although MRI is particularly sensitive in depicting the enlarged folia, vague radiographic findings and variable presentation may sometimes further complicate the diagnosis9,10. In addition, some other cerebellar lesions and especially medulloblastoma have also been reported to demonstrate radiological features mimicking LDD11,12. Likewise the pre-operative diagnoses were low-grade glioma in two of our four cases. So with respect to pathological diagnosis, especially in the absence of suggestive clinical data, awareness of this rare lesion is of extreme importance. The relative preservation of the cerebellar architecture seems to be the most important challenge for pathologist. Although the most prominent histopathological abnormality in LDD is the massive replacement and expansion of the internal granular layer by large neurons with vesicular nuclei, this replacement is not uniform and morphological severity varies between patients and within the individual lesion2. This variation was a pronounced feature of our cases. Although the enlargement and crowdedness of internal granular layer was a consistent finding, in two cases (case 1 and case 4) the enlargement was somewhat inconspicuous requiring a careful examination. In these cases there were also some scattered cells in the molecular layer that needed to be differentiated from other infiltrations such as glioma. The other two cases demonstrated an apparent enlargement with varying thicknesses. The frozen sections, on the other hand, demonstrated only some subtle changes and did not yield a diagnostic frozen report. In all of our cases the cellular arrangement was haphazard. The cells populating the internal granular layer had vesicular nuclei larger than that of the normal inhabitants. Nucleoli were prominent and our three cases (case 1, case 2 and case 3) demonstrated some degree of pleomorphism appearing as marked variation in nuclear size and shape. None of our cases had mitosis. The molecular layer also enlarges and usually appears as vacuolated in LDD2. In all of our cases there were fragments of molecular layer or white matter demonstrating some vacuolation. In case 1 and case 2, this appearance required differentiation from a glioma but in case 4 the vacuolation was not so prominent. Although calcification is another finding reported in LDD, we did not observe such foci2,6. In one of our cases (case 3) ectatic vessels was prominent as another known finding of LDD. None of our cases had proliferated vascular structures resembling to those of high-grade glial tumors. LDD is known as a lesion with a very low or undetectable proliferative activity6. Accordingly, in our cases proliferative activities estimated by Ki67 were lower than 1%. In the medical histories of our patients there were no other primary or secondary tumors. Further evaluation with respect to hamartomatous lesions and family history did not reveal any possible association with CD however our cases were not genetically screened for PTEN mutation. Although all of our patients are adults, the ages were distributed in a wide range. Still it is important to keep in mind that pediatric cases exist in the literatüre13. Since Lhermitte-Duclos is a quite rare disorder, there have been only a few systematic studies and literature data is largely from single case reports. Most of these reports focuses on the radiological features. However it is extremely important for the pathologist to be aware of the variable clinical and histopathological presentations of such a rare lesion particularly to differentiate it from the low-grade glial and neuronal tumors. In frozen sections the changes can be further subtle and even a normal appearing cerebellar tissue should be closely evaluated with respect to any derangement in the internal granular layer. 1) WHO Classification of Tumours of the Central Nervous System. Louis DN, Ohgaki H, Wiestler OD, Cavenee WK, editors. 4th ed. Lyon: IARC; 2007. 2) N owak DA, Trost HA. Lhermitte-Duclos disease (dysplastic cerebellar gangliocytoma): A malformation, hamartoma or neoplasm? Acta Neurol Scand. 2002;105:137-45. 3) Lhermitte J, Duclos P. Sur un ganglioneurome diffus du cortex du cervelet. Bull Assoc Fr Etud Cancer. 1920;9:99-107. 4) R obinson S, Cohen AR. Cowden disease and Lhermitte-Duclos disease: An update. Case report and review of the literature. Neurosurg Focus. 2006;20(1):E6. 5) Zhou XP, Marsh DJ, Morrison CD, Chaudhury AR, Maxwell M, Reifenberger G, Eng C. Germline inactivation of PTEN and dysregulation of the phosphoinositol-3-kinase/Akt pathway cause human Lhermitte-Duclos disease in adults. Am J Hum Genet. 2003;73:1191-8. 6) Abel TW, Baker SJ, Fraser MM, Tihan T, Nelson JS, Yachnis AT, Bouffard JP, Mena H, Burger PC, Eberhart CG. Lhermitte-Duclos disease: A report of 31 cases with immunohistochemical analysis of the PTEN/AKT/mTOR Pathway. J Neuropathol Exp Neurol. 2005;64:341-9. 7) N owak DA, Trost HA, Porr A, Stölzle A, Lumenta CB. Lhermitte- Duclos disease (Dysplastic gangliocytoma of the cerebellum). Clin Neurol Neurosurg. 2001;103:105-10. 8) Wei G, Zhang W, Li Q, Kang X, Zhao H, Liu X, Tang X, Wu Y, Han J, Yin H. Magnetic resonance characteristics of adultonset Lhermitte-Duclos disease: An indicator for active cancer surveillance? Mol Clin Oncol. 2012; 2: 415-20. 9) Thomas B, Krishnamoorthy T, Radhakrishnan VV, Kesavadas C. Advanced MR imaging in Lhermitte-Duclos disease: Moving closer to pathology and pathophysiology. Neuroradiology. 2007;49:733-8. 10) Bozbuga M, Gulec I, Suslu HT, Bayindir C. Bilateral Lhermitte- Duclos Disease. Neurol India. 2010;58:309-11. 11) Douglas-Akinwande AC, Payner TD, Hattab EM. Medulloblastoma mimicking Lhermitte-Duclos disease on MRI and CT. Clin Neurol Neurosurg. 2009;111:536-9. 12) Savardekar A, Salunke P, Ahuja CK, Rane S, Singla N. Unusual presentation in adult medulloblastomas: Imaging features mimicking cerebellar dysplastic gangliocytoma (Lhermitte- Duclos disease). Neurol India. 2012;60:555-7. 13) Capone Mori A, Hoeltzenbein M, Poetsch M, Schneider JF, Brandner S, Boltshauser E. Lhermitte-Duclos disease in 3 children: A clinical long-term observation. Neuropediatrics. 2003;34:30-5.